Back in the day, we went to Paris every year to fill our lust for mocha macarons, walks along the Seine, nights at the Buddha Bar (when it was still cool) and café society. We bought a new Longchamp bag on every trip. Mind you, this was back in early 2000, when the euro was new and the dollar still bought you something. We loved the sleek styling, colorful leather and playful fabrics–still do. This shot from the Fall advertising campaign makes our heart ache. 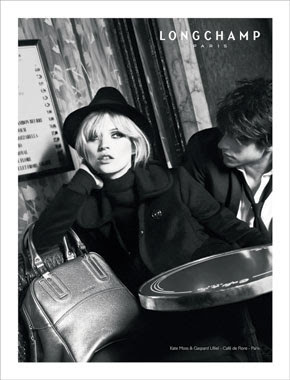 Shot at Café de Flore by Mert Alas and Marcus Piggott, Kate Moss looks so gorgeously chic with her blonde bangs that perfectly cover her eyes and her chapeau noir. That bag is to die for, too. The Cosmo tote bag comes in a gorgeous platinum leather and the size is perfect for sulking around Paris. Too bad it will set you back $1,065. Damn that euro! Starting on Tuesday, click on Longchamp.com to get a behind the scenes looking at the photo shoot. If we can’t go to Paris, at least we can visit it on our laptop. Tide is out to prove that “Sophisticated must be easy and easy must be sophisticated”….